Patanjali’s linked concepts of “sthira” and “sukha”–effort and ease–can help structure your teaching. Learn how situating your instruction between these two poles can help your students find harmony. Sarah Powers will be leading the SOYA Annual Retreat with her husband Ty Powers this coming June 6-8, 2014 in Naramata BC. Submitted by Mugs McConnell, ERYT500. Photo of Gail & Amy at the SOYA Retreat. This is a nice gentle twist that can be done in both directions. It can be used as preparation for Trikonasana (Triangle pose) or for those days when you want a gentler practice. We learned it from Dharma Mittra at the SOYA retreat in June. Come into table pose and step the left foot forward, between the hands. Leave the right knee down on the mat directly below the hips, forming a 90 degree angle at the knee. Both hands are placed on the floor as in table pose. Move your left hand to the inside of the left foot, beside the arch. Raise your right hand up towards the ceiling, rotating your torso to the right, and looking up if it is comfortable on your neck. Create a nice long line of energy through both arms. Breathe evenly and smoothly while holding the pose. Return the right hand to the floor and move the left hand back to the outside of the left foot. Keeping the right hand beside the arch of the left foot, raise the left hand up towards the ceiling. Rotate the torso to the left. Create a nice long line of energy through both arms. Breathe evenly and smoothly while holding the pose. Be sure to spend equal time in the pose on both sides to promote balance in the body. Increases the synovial fluid of the joints. Spine becomes more flexible and hips move more easily. Opens throat, chest and shoulders, which may help to increase lung capacity. Reduces discomfort from backache, neck pain and sciatica. Helps to relieve muscular problems in back and hips. Tones roots of spinal nerves and the sympathetic nervous system, and brings fresh blood supply to spine. Beneficial effect on entire nervous system. Benefits gallbladder, spleen, liver and bowels. Kidneys and abdominal organs are activated and exercised. For tender or injured knees, place a folded blanket under the back knee to give it extra cushioning. Twists tend to compress the diaphragm. As you inhale, lengthen the spine and as you exhale, revolve gently into twist. Pause and lengthen again on the inhalation and rotate farther with the exhalation. Do not let the cervical spine do all the work – the head and neck should follow the movement, not lead it. For neck pain and discomfort, look down. Be conscious not to over-twist in the more mobile areas. Try extending the movement into some of the more resistant areas. Some twists in combination with forward bends can strain the back. Watch range of motion for lower back or sacroiliac joint strain. My first response to the question was, “When the prana is able to go into the sushumna” but of course the next logical question that came back was “How do you know when it does that?” There are certain things that occur, like unmani avastha, a state of deep concentration where the breath stops and the mind becomes still (Hatha Yoga Pradipika Chapter 2 verse 4-10). Swami Sivananda says in his book “The Science of Pranayama”, when the nadis are purified there is a “lightness of the body, brilliancy in complexion, increase of the gastric fire, leanness of the body, and the absence of restlessness”. He says in the first stage of purification perspiration arises without effort, the middle stage is the tremor of the body, and the last stage is levitation in the air” (or in a broader sense, siddhis begin to appear). When you do a cleansing fast, you really notice the difference in how you feel during and after the fast. It is difficult at first, and you may feel rather ill as the toxins are cleaned out. As time passes, you begin to feel lighter and brighter and terrific! It is similar when you do yoga practices to cleanse the nadis. At the start you may not feel too well as blockages begin to release. Blockages in the nadis often manifest themselves physically, so you may feel symptoms such as headaches, emotionally off balance, or one nasal passage becomes blocked. Gradually, over time through the cleanse you have more energy and more clarity too. You feel good about yourself and your discipline and the results are generally quite delicious. There is a peacefulness that comes with the cleansing of the nadis because the thoughts are no longer jumping between the right and left brain… the union of “ha” and “tha” has brought this into balance and we experience santosha or contentment. But nadis can become impure again if you, for example, reinstate junk food into your body, smoke, allow negative thoughts to run untamed, or cultivate ill intentions. So the nadis don’t necessarily stay purified if you don’t keep up your practice on all levels, on and off the mat. When we do our yoga we are working with more than the physical body. Our sadhana also affects the astral body (which includes the emotional and mental aspects of our being), and the causal body (which involves our spiritual well- being). Each layer of maya we uncover takes us closer to another vritti or samskara to perhaps deal with. As we change and develop our thought patterns through our yoga practices (ie: how we respond to new circumstances) they reflect the cleanliness of our nadis. Pure thoughts = pure nadis, and negative thoughts such as fear or anger = not so clean nadis. In Chapter 2 verse 4-10 in the Hatha Yoga Pradipika we discuss the cleansing of the nadis. (4) When the nadis are impure, breath cannot penetrate into the sushumna. Then the yogi achieves nothing, nor can he reach the state of deep concentration [unmani avastha]. If there are blockages in our 72,000 nadis then the prana, or life force, is impeded in its flow. 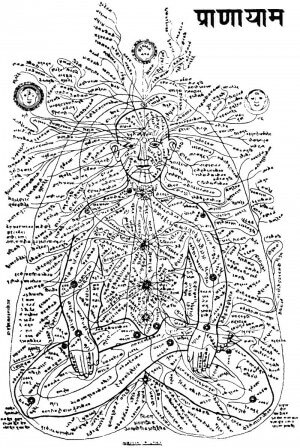 Nadis are the energy channels for the flow of prana, the life force that brings movement to our bodies and thoughts. The chakras are transmitters of this energy, and they have the potential to transmit both positive and negative energy depending upon where our thoughts and behaviours are centered. Therefore, this energy is expressed or manifested in our outward actions through our body. I often say “I see myself through the reactions of others towards me.” If I am angry or annoyed, this will create a reaction in others that reflects my state of mind. If I am angry or annoyed, I am distracted (attachment) and I cannot concentrate. My state of mind is a reflection of how purified my nadis are. As yogis we are constantly trying to live a higher life and increase the supply of prana through the nadis to the sushumna. Only then will we feel peaceful and therefore be able to reach the state of deep concentration. (5) Only when all the nadis, which are still impure, become purified can the yogi practice pranayama successfully. (6) Therefore one should practice pranayama with the mind in sattvic condition until the sushumna is free from impurities. Here we are back to the basics of the yamas and niyamas. A sattvic mind is essential for success in ALL practices of yoga, and definitely during the practice of pranayama. Pranayama is the ability to control the movement of the life force. It establishes intention and focus. A wandering mind means the prana is being dissipated away from the task at hand – yoga or union with the Self. A sattvic mind is reflected in our outward expressions through our body. Kindness, compassion, understanding, patience, a peaceful presence, loving actions; these are all outward expressions of a sattvic mind. By practicing the positive expression of your True Self regularly, steadily, and catching those negative thoughts before they get a chance to have any power, it will help you to maintain the sattvic state of mind, particularly during pranayama. Sattva must become established in thought, word and deed. This may seem like far too much of a challenge, but we are given the tools to change our thought-waves from negative to positive in Patanjali’s yoga sutras where we discover the mind is made up of “manas, buddhi and ahamkara”. Manas is that which records the incoming information from the senses. Buddhi is that which classifies this information as truth, untruth, etc. Buddhi is normally clouded by the ego, the ahamkara, and therefore classifies information under the influence of the ego. This is because we are more in tune with our “ego-personality” than we are with our Spirit. The Spirit is rich with the qualities of love, peace, compassion, non-judgment, etc. The ego-personality has the potential of both positive and negative qualities because it is in this manifested world. Therefore, we must establish the habit that each time the mind receives information through the senses, we pause before judgment. We don’t make assumptions, we don’t jump to conclusions, but we filter the information based on the higher principles of yoga beyond the ego, and then classify the information according to the principles of the Spirit. Let me give you an example. An older couple lived in my community. The wife passes away in the fall, and I went to Mexico for the winter. When I returned, I was walking by the man’s home and saw a woman going in the front door. I immediately assumed he had remarried. Recognizing my quick assumption, I immediately stopped the thought wave of him being remarried to further assess the situation before I jumped to conclusions. She could have been his sister, housekeeper, friend… there were numerous options! Manas had recorded what it had “seen” through the eyes (senses). My ahamkara “ego-personality” immediately influenced the buddhi to classify this information based on the assumption the man had remarried. I caught myself by observing my thought waves, and thus stopped the influence from the ego-personality, allowing the buddhi to reclassify the information as based on no truth whatsoever. Simple example of how we control our thought-waves. Not a very important situation (and really none of my business), but this is how our mind works! So by putting this process of observation into practice on the little things like this will create a new standard of observation for when we encounter the bigger, more important circumstances in life where we really need to see things “clearly”! No matter how unimportant the circumstances may seem, it is always important to establish yourself in Truth, sattva, a pure mind. (7) Assuming the padmasana posture, the yogi shall guide the prana through the left nostril [chandra = moon] to the ida nadi, and, after having retained the breath as long as possible [in kumbhaka], should exhale it through the right nostril [surya = sun]. (8) Then he should inhale through the right nostril, do kumbhaka according to the rule, and exhale through the left nostril. (9) Inhalation is [always] through the same nostril as the previous exhalation. After the breath has been retained to the utmost possible limit [until perspiration breaks out or the body begins to trembler, one should exhale slowly–never quickly [since that reduces the energy of the body]. (10) Take in prana through the ida nadi and exhale it through the pingala. Then take in [new prana] through pingala and release it through ida, after having held it [in kumbhaka] as long as possible. The yogi who has perfected himself in the yamas [having thus developed the sattvic mind] will purify his nadis in three months [of practice]. https://soyayoga.com/wp-content/uploads/2013/12/nadi-sodhana-2-e1387560017870.jpg 201 235 Robert McConnell https://soyayoga.com/wp-content/uploads/2013/08/20-logo-training-excellence.png Robert McConnell2013-12-20 09:27:562016-05-16 22:53:05How do I know when my Nadis are Purified? Chair Yoga for Parkinson’s Disease and other Movement Disorders. WHAT IS PARKINSON’S DISEASE? PD is the second most common degenerative neurological disorder after Alzheimer’s disease. PD is caused by a loss of dopamine (a chemical in the brain that controls the way messages travel from one nerve cell to another) in the area of the brain called the “substantia nigra”. The cells that produce dopamine begin to die, reducing the amount of dopamine. The symptoms of Parkinson’s appear when over half of the dopamine cells are lost. The progression of the disease and accompanying symptoms vary with each person. WHAT ARE THE MOST COMMON SYMPTOMS OF PARKINSON’S? Most of the evidence showing that yoga is beneficial in slowing down the disease’s progression is, for now, anecdotal and comes from yoga instructors, people with Parkinson’s disease, and physical therapists. I have been working with people who have Parkinson’s Disease (PD) for the past 10 years and have seen firsthand how Yoga and stretching has helped them with their balance, flexibility and mobility. It connects them with their breath (which keeps them present and reminds them to slow down), it induces relaxation which helps control tremors, activates affected muscle groups, teaches them where their body is in space and how it should move, and takes them to a place of calmness. I’m told that they feel more limber and taller after the class, and more relaxed. Most people, when they are first diagnosed, notice that one side of their body is more affected than the other; this can eventually cause an imbalance in their posture and gait. Stiffness in the body’s core is one of the most debilitating symptoms of PD because it hampers a person’s ability to walk across a room or simply stand upright. When we walk, our body is meant to naturally twist at the waist, bringing one arm forward with the opposite foot, keeping the rotation in our trunk and helping us move with ease and grace; this is our natural gait pattern. Although the specific effects of PD can differ significantly from person to person, people with PD may be particularly prone to problems in their feet because of the difficulties they can experience with gait, posture, cramping in the feet, and balance which increases their chances of falling. Abnormal foot function can cause a person’s stride length to shorten, increasing the amount of time both feet remain in contact with the ground. Rigidity in the ankles can also cause normal gait loss and a shuffling action can predominate. A flat-footed gait can produce foot, leg, and knee pain and reduce ability to absorb the shock of ground contact. All this can lead to falling, which in turn instills fear of falling again and the person begins looking down which unfortunately begins to create a flexed spine. Restorative twists poses can help prevent rigidity for people with PD by strengthening the trunk and increasing flexibility through the waist, and bringing focus on posture. This helps to reduce stiffness in the body, help maintain a normal gait and a sense of balance, and improve mobility. By working the muscles of the trunk, we can help our clients come back to a normal gait, which in turn, will affect their overall posture. (See Seated Chair Twist in this enews). Rhona Parsons CPT, RYT500, SOYA, IYTA is Registered Yoga Teacher, Master Trainer of Bender Ball, CanFitPro – FIS, PTS and Stott Pilates Instructor. 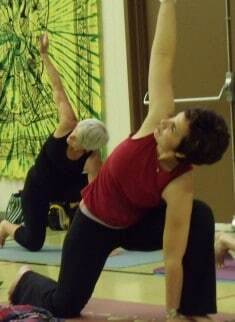 She leads workshops for Yoga Teachers on Yoga for Parkinsons Disease. If find out more about her upcoming workshops, or to invite her to lead one, please contact her at pilates4life@hotmail.com. If you would like to read her full Specialty Project on “Chair Yoga for Parkinson’s Disease and Other Movement Disorders”, please email us at info@soyayoga.com.